Heat up oil in pan. Add mustard seeds, cumin seeds, curry leaves and let them crackle. Add urad dal and saute for few seconds. Add sooji to it and roast for 2-3 minutes on low heat. Let it cool down. Add yogurt, spinach puree and salt to taste. Finally add baking soda and mix gently. Add water if needed. Consistency of batter should be medium. Grease the idli moulds and and pour mixture in it. Steam the idlis in idli steamer for about 20 minutes. Serve with sambar or coconut chutney. 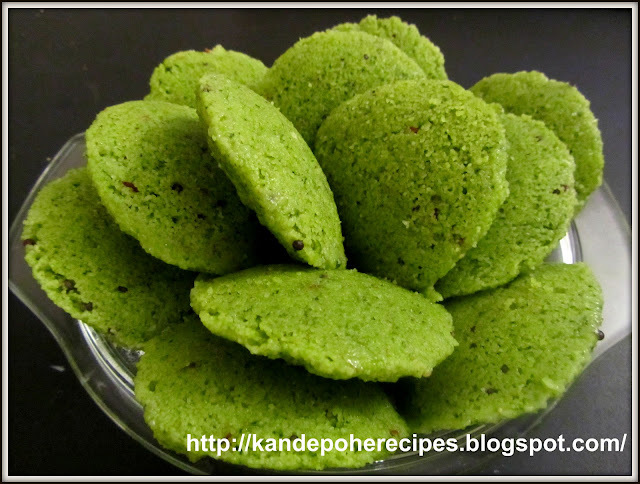 Wow wat a catchy and healthy idlis.